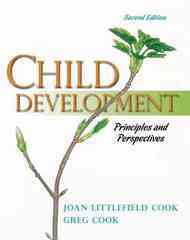 Child Development 2 Edition The topically-organized Child Development, Second Edition combines streamlined coverage with an application-driven active learning system. Cook and Cook focus students on how they can promote positive child development by putting the science to work outside of the classroom. Looking for additional resources to help you understand the material and succeed in this course? MyDevelopmentLab contains study tools such as flashcards, self tests, videos, as well as MyVirtualChild which allows you to raise your own virtual child from birth through age 18 and monitor the results. Want to learn more about MyVirtualChild? Visit www.mydevelopmentlab.com and click on the ‘watch this video’ link to learn about MyVirtualChild. MyDevelpmentLab with MyVirtualChild is available at www.mydevelopmentlab.com.